The New York Bank Hoard. 9999 Fine Proof Gold Brexit Coin SKU41689. 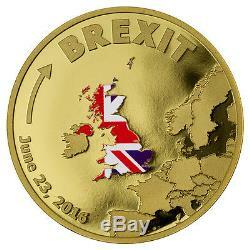 Why add this gold Brexit coin to your collection? On June 23rd, 2016, Britain held a referendum to leave the European Union. This event has had, and will continue to have, many effects on global policies and economies. 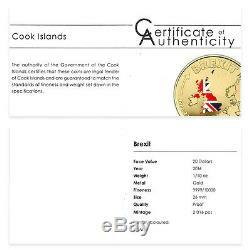 To commemorate this significant moment in history, the Cook Island have authorized colorized Proof gold Brexit coins. Each coin is struck out of 1/10 oz. 9999 fine (24 Karat) gold! As well, very special BGM (Big Gold Minting) technology was used when minting this coin, and its diameter was greatly increased to 26mm! This is almost double the size of other 1/10 oz. Design of the gold Brexit coin. The reverse features a map of the United Kingdom and the surrounding countries. The United Kingdom has been colorized with the United Kingdom's flag. The date of the Brexit vote has been inscribed along the edge of the coin, along with the word BREXIT. The obverse features an effigy of Her Majesty, Queen Elizabeth II. Secure your gold Brexit coin today. Don't hesitate and risk missing this once-in-a-lifetime event. Place your order for the 2016 Colorized Proof Gold Brexit coin before it's gone! We cannot make any price adjustments after the sale is complete. Product Photo Policy: MCM attempts to display product images shown on the site as accurately as possible. 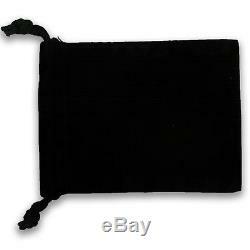 We take all of our photos in house and due to reflections on the mirrored or proof surfaces of a coin there may appear to be'black' when there is not. If a coin has a color on it at all it will be described as'colorized' in the description or title. Due to the large inventory we sell, we use stock photos. Serial numbers will vary from the image shown unless specifically stated in the product listing that the item pictured is the item you will receive. INTERNATIONAL ORDERS POLICY: We are accepting international orders from select countries. These charges are the customer's responsibility. However, we cannot guarantee this due to the volume of orders we process each day. Beyond the 30-day return period, Company is under no obligation to accept return of any product, but may in its discretion do so pursuant to this policy, for up to one year from the invoice date. ModernCoinMart (MCM) was launched in 2004 and quickly set the standards for online sales of bullion, US coins and world coins. Join over 100,000 loyal customers and feel confident purchasing from a company that's spent a decade building a solid and stellar reputation trusted and recognized around the world. That's the MCM way. This listing is currently undergoing maintenance, we apologise for any inconvenience caused. 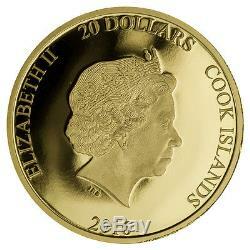 The item "2016 Cook Islands $20 1/10 Oz. 9999 Fine Proof Gold Brexit Coin SKU41689" is in sale since Thursday, June 30, 2016. This item is in the category "Coins & Paper Money\Coins\ World\Australia & Oceania\South Pacific". The seller is "mcm" and is located in Sarasota, Florida. This item can be shipped worldwide.